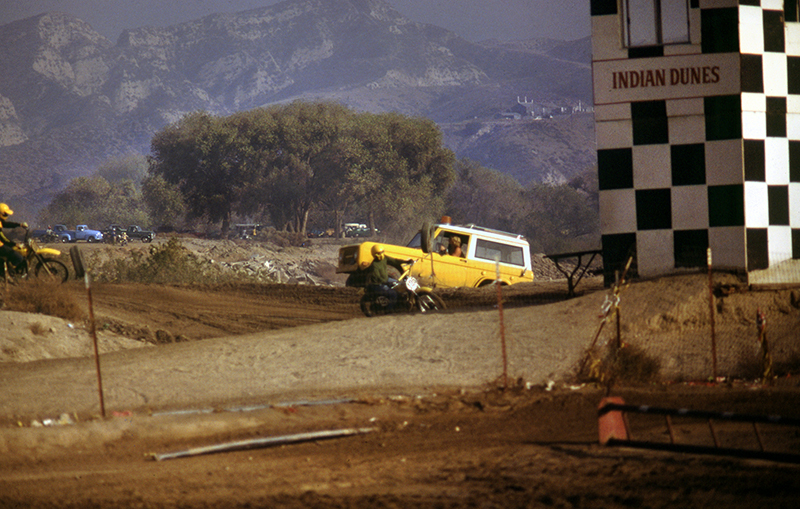 SCVHistory.com LW3483 | Valencia | Motocross Riders at Indian Dunes, April 1978. Motocross riders at Indian Dunes, April 1978. Riders unidentified. Opened in 1970 by The Newhall Land and Farming Co. to compliment its other attractions that put Valencia on the map — a public golf course designed by Robert Trent Jones and a magical amusement park that was under contruction — Indian Dunes was a 600-acre motocross park that featured two motocross tracks ("International" in the front and "Shadow Glen" in back along the Santa Clara River), as well as a flat track and a mini bike track. Frequented by Steve McQueen, it was located west of the new Interstate 5 and south of Highway 126. It closed in February 1985. LW3483: 9600 dpi jpeg from Kodachrome transparency (35 mm slide film) purchased 2019 by Leon Worden.